If the thought of a giant robot bear picking you up doesn’t sound too scary, consider spending your old age in Japan. State-backed research center Riken is developing a bear-like intelligent lifting machine that can help move elderly and bedridden patients into wheelchairs and beds. 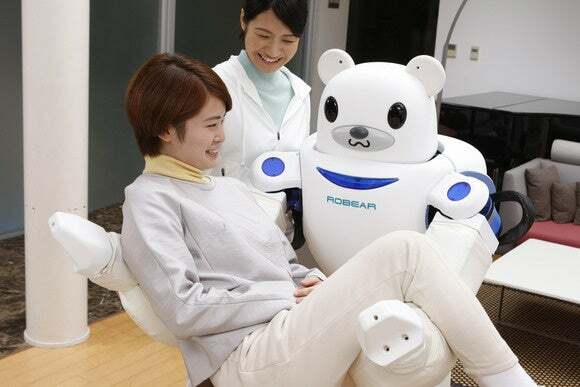 Equipped with giant padded arms, Robear is the latest in a line of prototype nurse robots designed to take on some of the backbreaking work of caregivers who must lift patients an average of 40 times per day in Japan, which has a rapidly greying population. In contrast to the earlier prototypes Riba and Riba II, Robear is capable of gentler movements because it has capacitance-type tactile sensors that feed data to its actuators, which in turn can quickly sense any resistance to exerted force from patients’ bodies. The tactile sensors are based on auto parts maker Sumitomo Riko’s Smart Rubber, a flexible rubber sensor that can measure pressure and deformation. The robot also has six-axis torque sensors, cameras, a microphone and 27 degrees of freedom, or axes of motion. At 140 kilograms, the 1.5-meter-tall Robear is 90kg lighter than Riba II, unveiled in 2011. Engineers gave it a smaller base with retractable legs that can be deployed for stability during lifting operations. The legs can be stowed to move the robot around. A YouTube video by Riken shows Robear slowly embracing and lifting men as they hug its head, which resembles that of a cartoon polar bear. The droid still requires human control, however—either by manually guiding its arm or via a linked Android tablet—and its lifting capacity is still only 80kg. It can operate for about four hours on a charge of its lithium-ion batteries. Though Robear comes from a line of nurse-bot prototypes going back to Ri-Man in 2006, Riken is not aiming to commercialize the machine itself. Instead it hopes the technologies could go into a practical nursing-care robot.